Finally, I went and try out the arcade that i wanted to play for a long time, DJMax Technika, and here is my little review of the game. The arcade looked really nice and stylish, with 2 big screens and one of them is touch screen, no physical button or anything, it just neat. But actually i do expect the screen to be a bit bright or sharp. Dont know if they tune down the brightness. The speaker of the arcade is not that impressive, only OK OK, but luckily they have not one, but two headphone jacks, with a volume control. And I did bring my own headphone while playing the game, so IT ROCK~!!! One of the most impressive feature of the arcade is the vibrating stage. Its quite fun to feel the bass while you are playing the game, and not to forget that, the external sound system still will rock even if you plug in your earphone jack, so that people will still saw your performance. 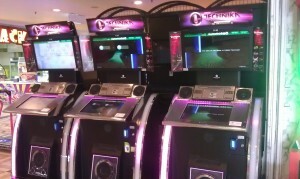 From what i found, there are 5 machines located on Genting Arcade Center. Each game cost RM4, and I heard there ARE some machines that are located in KL. So do keep an eye on your favorite arcade center and hopefully they will get the machines some day. All machines in genting are connected to the internet, which means you CAN use a ID card if you have one, but unfortunately, you cant get any ID card in Genting. DJMax Technika is a really unique game, its like no other game, which means the gameplay process is completely new to me. Im really lazy to explain how to play the game, you can watch it on the youtube video below. The game have three difficulties levels, Lite, Pop and Technical mode. For me personally, Lite mode will be a little bit too easy while Pop is a little bit too challenging for me. Note that i didnt spend many time and money on the game, since I’m broke, RM4 a game is NOT CHEAP for me. On Lite, i can finish the game easily, but on Pop, i can hardly finish any songs with 6 stars and above. And for those which i had manage to finish, my “blood” has only a few left. One thing make me dont understand is, i manage to pass two stages with a little bit “blood” left, but they show me game over… =.= RAGE!!!!! One serious flaw of the game and make me damn RAGE and wasted RM8 on two games are the FREAKING CONTINUE BUTTON!!! And im stupid enough to accidentally click on the Continue for 2 times… GG gone my money….. cos its not like i will be able to pass the song anyway. I seriously think you will need earphone to play the game, because when 3 machines placed side by side, although the other two have no one playing at that time, but the music and noise generated on those freaking loud machines does distract you quite a bit. DJ Technika 2 is already released long time ago in Korea and US, but what to do, we only get Technika 1 after so many years, rumors are the hardware are the same, but i dont think Pentavision will offer a software upgrade only… How sad is Malaysia arcade scene. Oh ya, i do really hope there are machines that being moved to KL, and place on those well maintained arcade center, and please lah, RM3 only can? Hahaha. And anyone know why we cant get the Technika IC here? There are internet connection, but no IC card selling here, how to play online?!? Oh… actually the DJMax Technika “can” be ported to Touch screen based smartphone right? Not that hard…. PENTAVISION, Y U NO DO THAT?!? I know i know, you want to sell more arcade machine. I dont blame you. OK enough of rant and thats all for the review. im busy writing my educational blog, and some projects, and some work, and some school work…. SO SO SO BUSY.